The Rev. Redmond is included in this section due to his service as an army chaplain during World War 1. Rev. John Redmond, former rector of St Bride's Church. A native of County Armagh, John Redmond, born on 5th February, 1876, was the son of the noted Johnston Redmond of Tararaghan Grange, Portadown, a distinguished grower of the Bramley apple. Educated at the then Intermediate School, he furthered his education at the University of Ireland where he gained his Bachelor of Arts degree in 1899. He commenced his ministry as Curate Assistant in the Parish of St Aidan’s, Belfast from 1912 - 1915 and served a further year in the Parish of Holywood in the Diocese of Down before becoming a Chaplain to the Forces in 1916. For two years he exercised a dedicated pastoral ministry among soldiers who held him in very high regard. A ministry that he greatly loved came to an end all too quickly when he was called upon to assist as Curate Assistant for two years in the Cathedral Parish of St Anne’s, Belfast. As stated in the ‘Kilbride Herald’ (the local Parish magazine) Mr Redmond features prominently in a display in the Somme Heritage Centre in Conlig, near Newtownards. ‘The exhibition features him in days as an army chaplain in which role he was dearly loved and highly respected by all the soldiers in his care’. In the year 1920 Mr Redmond was appointed Vicar of the large and sprawling Parish of Ballymacarrett. ‘The Flock had grown at such a rate that the Vicar could not have expected to adequately serve all the needs of the Parish’, so inevitably Mr Redmond made many changes and proved to be a brilliant organiser. As a result of a door-to-door census of the Parish he found that 18,000 people claimed to be members of the Church, but around 13,000 never darkened the door. He was appalled at the number of people who never opened their Bibles, said their prayers or who could not repeat The Ten Commandments. He was distressed that there was little provision made to encourage children to follow in the ways of the Lord. To meet this urgent need he set about re-organising the Parish into six districts, each with a Curate Assistant, a Superintendent of Sustentation, and a band of workers who were to assist in the work of the Church and its outreach; and the building of new Halls in each section of the Parish. They in turn raised sufficient funds to enable the Parish to pay its way. Due to the hard work and diligent ministry for a period of almost ten years it was inevitable that Mr Redmond was ready for a lighter charge as the stress and strain of it all led to a breakdown in his health. It was at this stage that he was obliged to resign as Vicar of St Patrick’s, Ballymacarrett, and take up the ‘light duty’ at St Bride’s Church in the Parish of Kilbride on 5th January, 1930. After a short period of rest and recuperation in a small country parish the Reverend Mr Redmond began what has been described as ‘a most faithful and successful ministry’ for 22 years, preaching and teaching the Christian faith both in Church and in the local school. Although he never drove a car or rode a bicycle he visited his parishioners regularly on foot, together with his dog, a Great Dane, named Sheila. Always concerned about the needs of people in the entire district he was responsible for the building of six houses in the village of Doagh, known as Edenmore Terrace on the Burn Road, the income from which added greatly to the Parish economy. Mr Redmond was well known in Doagh and Ballyclare district for his Annual Sports Day held at Dixon Park, the home ground of Ballyclare Comrades Football Club. Although the weather was seldom favourable for sporting activities in the middle of summer the competitions organised by the Rector drew large crowds from far and near and everyone seemed to enjoy the fun and excitement of the day. The Select Vestry and Parishioners always appreciated the Reverend John’s endeavours, which were always successful, in helping to augment the finances of the church. In making a financial appeal his typical phrase was: “No coppers please; just a silver collection!” hence the common name by which he was known was ‘The Reverend Silver John”! Having completed a long, unique incumbency in the Parish of Kilbride, Mr Redmond retired from the Ministry of the Church on 30th September, 1951, and moved back to his homeland for a period of 16 years in happy retirement. He passed on to his eternal reward at the great age of 91 years on the 17th July, 1967, and his ashes were interred in Tartaraghan Parish Churchyard in the present of a Kilbride Parishioner who was able to say: “Well done thou good and faithful servant: enter into the joy of the Lord”. Rev. John Redmond was recorded as being a padre in the Royal Army Chaplains’ Department. He was interviewed on 16th December, 1915, deemed to be medically fit and was commissioned as a Temporary Chaplain to the Forces 4th Class (ranking as a captain) from 1st January, 1916. John Redmond obtained a BA in 1899. He was ordained deacon in 1912 and priest in 1913 by the Bishop of Down. Then was curate of St Aidan's Belfast 1912 - 15 and curate of Holywood 1915 - 1916. He was a Temp Chaplain to the Forces 1916 - 18. He then became curate of St Anne's Cathedral, Belfast 1918 -20. From there he moved to become vicar of Ballymacarrett 1920 - 29; then curate in charge of Kilbride 1929 - 1935 and Rector from 1935. He lived at Kilbride Rectory, Doagh, Ballyclare. Medal entitlement is recorded as the Victory Medal and the British War Medal on his medal card. He applied for his war medals in 1928 and they were sent to St Patrick's Vicarage, Strandtown, Belfast (the date recorded against the issue of these medals was 15th May 1928). Rev. John Redmond CF was assigned to the 36th (Ulster) Division as padre. He arrived at the Somme on 16th June, 1916 and witnessed at first hand the dreadful loss of life and terrible injuries suffered by the soldiers who took part in the Battle of the Somme and subsequent battles. He was based at a casualty clearing station a few miles behind the front and spent time with the pastoral care of the wounded, writing letters to the families of soldiers who had died and conducting funeral services. Rev. Redmond was later attached to the 9th Battalion, Royal Inniskilling Fusiliers during their time fighting at Wijtschate when the 36th (Ulster) and 16th (Irish) Divisions fought alongside each other. When he returned to clerical duties in Ireland he rarely spoke of his wartime experiences but he did keep detail of his time as a chaplain in his diaries. Serving as an army chaplain during World War 1 also had its dangers as from around 4,400 chaplains recruited 179 lost their lives in the conflict. 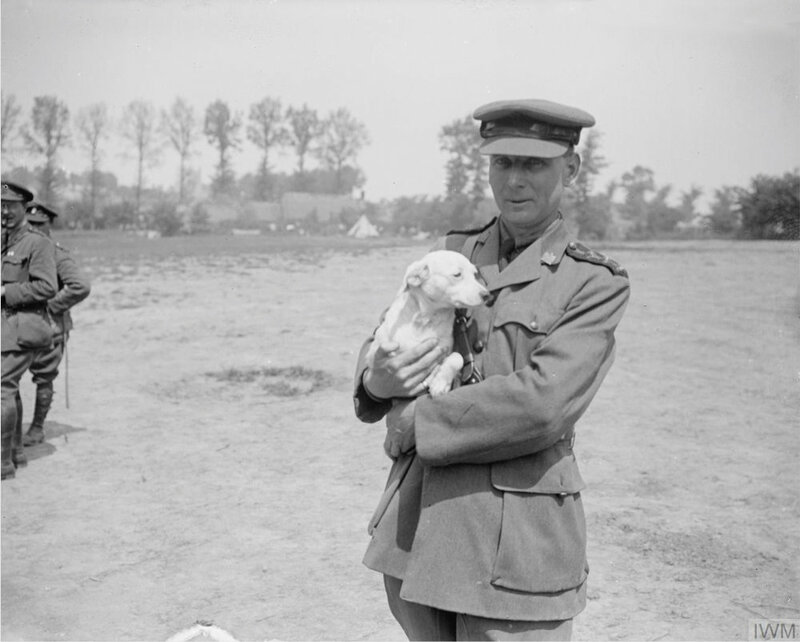 The Reverend John Redmond, a chaplain, holding a dog. Near Dranouter, West Flanders, Belgium on 12th June 1917. Image courtesy of the Imperial War Museum. I hope you are now settled in your new parish. I want to tell you again how so very sorry we all are at you having to leave us, and to thank you for the work you did in my brigade. It was very much appreciated by all ranks and you will be greatly missed I can assure you. Wishing you the best of good fortune.